A set of Bluetooth portable speaker that comes in a ruggerized case, and looks the part. IPX5 rating makes it splash proof, while the case gives it strength and ruggedness, so you can carry it about with you without worrying. It also includes a built in battery to charge your devices, and throws in NFC pairing as well. It also features a speakerphone. This speaker has a very unique feel to it, giving it a very military look. The top includes buttons for power/volume/play while the front has a grill that hides the speakers and an LED. The back has a cover on it which can be opened to reveal ports as well as buttons. The speaker feels solid, and secure in your hands. The setup is fairly simple. After power on, hold the Play button to go into pairing mode. Once there, you can scan for it on your mobile/device and pair with the BRV-1. These are extremely easy to use. Once paired, the unit can be used to listen to music, video, voice calls, and other such uses. The buttons can be used to control the device as well. 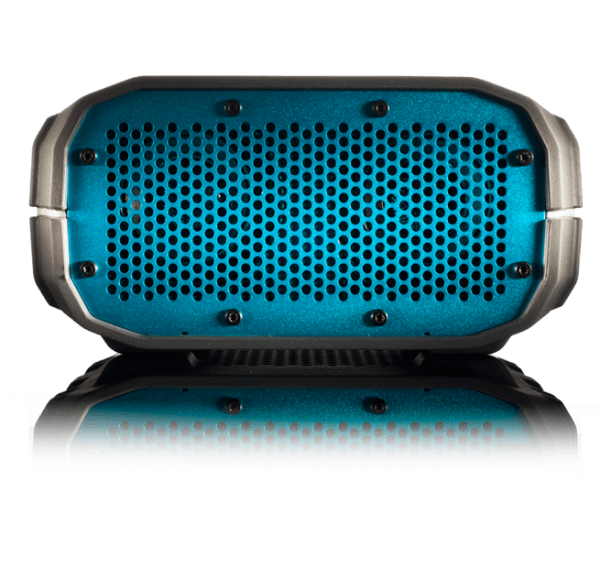 Much like the Braven 710, the Braven BRV-1 packs a lot of power with it. However, what really sets it apart is the bass this unit offers. Drums can actually be felt, and if you place it on a table, get ready to feel the table resonate in all the oomph this little speaker packs in. If you like your bass, or like to dance to thumping music, this is definitely the device to go for. The speaker has been well designed, and once you go past the amazing bass, you can notice how well the sound is produced. The notes are all clear, and even talking on the phone is great. These do not go quite up to 11, but there is no distortion at its highest volume. These qualities make these quite handy. Another thing that sets this speaker apart is the rugged case and the water resistance. You can throw it in any situation you like (apart from under water! ), and it can pretty much deal with it. Rain, beach, parties, parks. This is ready for everything. Being small and light, you won’t even notice you’re carrying it till the music starts to play. An interesting look packed with a lot of features, and of course a great sound make these speakers another great on our list of speakers to own. Another must buy, specially if you are an outdoorsy person!